"Thank you for treating my goopy eyes." Your Lhasa has beautiful eyes -- if you can see them under her hair. If you notice a discharge, take her to the vet for an examination. 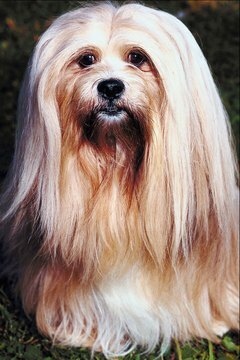 Lhasas are prone to dry eye, formally known as keratoconjunctivitis sicca. Not only it is uncomfortable, but untreated dogs can lose their vision. Keratoconjunctivitis sicca occurs when there isn't enough aqueous tear production on the surface of your Lhasa's eye or in his eyelids. Eventually, his cornea becomes very dry and inflamed, as does the white part of his eye, the conjunctiva. In some dogs, keratoconjunctivitis sicca results from eye trauma or as a reaction to certain drugs or anesthesia. While it's not clear if dry eye in Lhasas is hereditary, it's a common condition in the breed. An eye discharge, informally known as goop, is the primary symptom of dry eye. It's not usually just a little discharge, and it can be long and stringy. This is also a symptom of conjunctivitis, better known as pinkeye, but it's not the same eye issue. With dry eye, you can clear away the discharge only to find a substantial amount in your dog's eye a short time later. You'll also see his third eyelid emerge. Your dog blinks constantly and his eye could swell. He might frequently rub his eyes with his paws to ease discomfort. Think how it feels to have something stuck in your eye. That's sort of what's affecting your Lhasa. Your vet uses the Schirmer Tear Test to diagnose dry eye in your Lhasa. She'll put a filter paper in the corner of your dog's eye, on the tear pool. The paper stays there for one minute. When the time's up, your vet measures the amount of wetness on the paper. Minimal wetness indicates dry eye. Your vet also stains your dog's eye to determine corneal ulceration and tests the eye fluids for bacterial infection. Your Lhasa might require daily administration of artificial tears for the rest of his life. You'll also have to clean any goop out of his eyes every day. Your vet might prescribe cyclosporine for inflammation and tear production. If your dog's eyes are infected, antibiotics are in order. You'll take your dog to the vet regularly for monitoring.